UPDATE: I sold this one on eBay because I didn't enjoy it very much, so it is no longer in my collection. However, you can still read my review below to get information on what it's like. Unfortunately, if you have any questions that haven't been answered here, I will probably not be able to answer them since I no longer own this pet. Feel free to comment anyway because you never know ;) Thanks for reading! 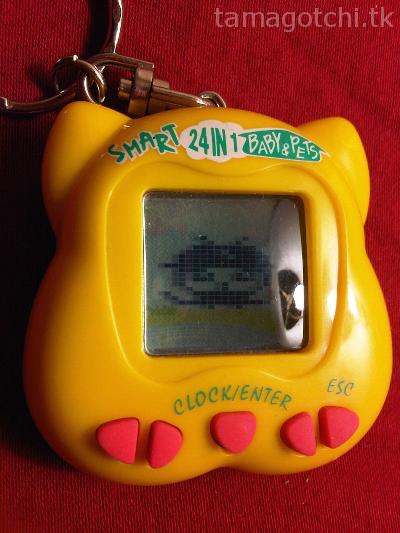 24-in-1 Smart Baby and Pets is a multi-pet based on Gyaoppi programming. It contains 24 different characters to choose from, several of which are repetitive. For instance, there is a baby girl and a baby boy to choose from, as well as different bugs to choose from. It has some characters in common with the Super Gyaoppi 9-in-1, as well as several new additions to the line-up, such as a squirrel and a racoon. 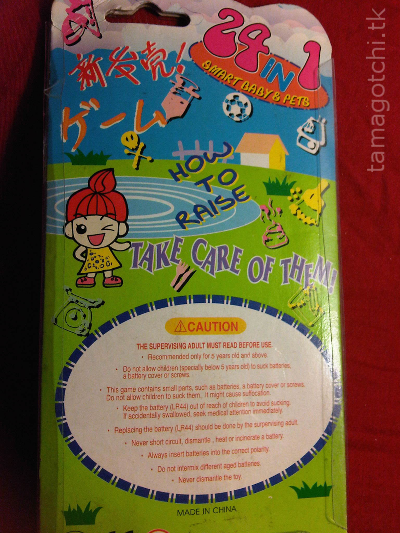 The few times I have tried raising it the characters have died, mostly because I couldn't figure out how to play the games to raise the happiness, since giving snacks won't raise the happiness meter. I finally figured out the two games, one of which was kicking a ball into a goal, and the other one was catching falling stones in a hat, but both are extremely difficult to play and take a lot of practice. I have still never managed to win the soccer game, but I did win the catch game a couple of times. Eventually the games get so frustrating that you just give up and don't want to play with this virtual pet anymore. It's not a pet I would recommend buying, but I like it because it has some unique characters lol I will post pictures of each character. 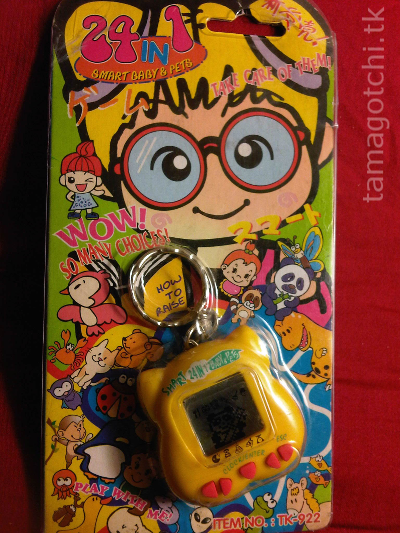 I've never seen this virtual pet any other time on eBay, which leads me to believe it is extremely rare. The shell is pretty ugly in my opinion. The buttons are also really confusing and don't really make much sense. I got mine for about $40 through the Facebook groups, but I wouldn't recommend anyone else bother buying it for that much since it isn't that great of a pet to care for. I would recommend getting a Super Gyaoppi 9in1 instead of this Smart Baby and Pets.